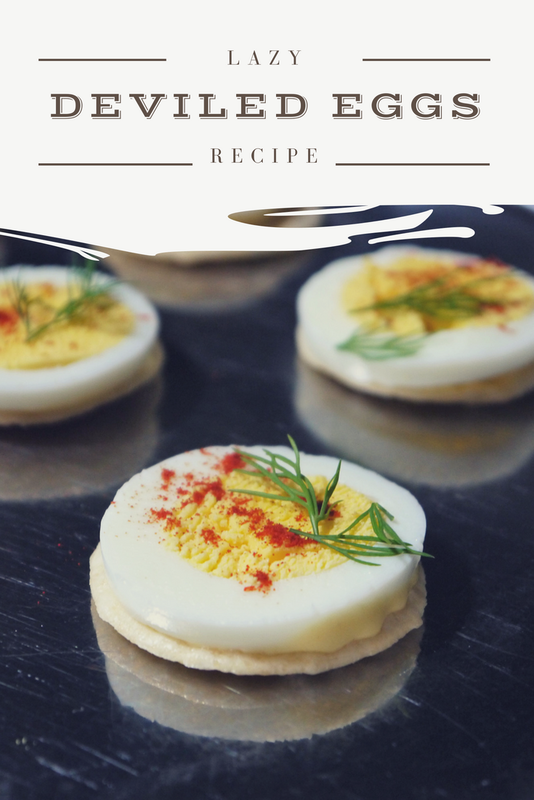 Deviled Eggs are always a hit at parties and potlucks. My aunt's deviled eggs are famous in our family. But they're kind of a pain to make and transport, even if you have a fancy deviled egg tray. These lazy versions are much easier! You don't need a piping bag or any other special tools - although there are a couple of pieces of equipment that do make these especially easy, but you can make them without anything special. Instead of scooping out the yolks, you just slice up hard boiled eggs, season them and serve them on a cracker. It couldn't be simpler! And you can transport the peeled eggs to your location and make them fresh on site quickly, instead of transporting piped egg halves that can get squashed. One of the things that makes this particular recipe so easy is using an Instant Pot to cook the eggs. If you don't have one, you can just hard boil your eggs the normal way, but the Instant Pot makes wonderful hard boiled eggs that never get that green line around the yolk. To hard boil eggs in the Instant Pot, use the rack. Put a cup of water in the bottom of the pot and place your eggs on the rack. This recipe calls for only 3 hard boiled eggs to make 18 bites, but why not cook more eggs to double the recipe or have for lunch during the week? Release the pressure manually, remove the lid, and use tongs to plunge the eggs into a bowl of ice water to stop the cooking. The nice thing about the Instant Pot is peeling the eggs. The peels come off beautifully! I do recommend peeling them just after cooling, because the peels are a little harder to get off cleanly if you refrigerate the eggs in their shells. Mix some mayonnaise and Dijon mustard together. Spread a little on 18 plain rice crackers. Peel the eggs and slice them into even rounds. An egg slicer is really great to have for this step, and super cheap. If you don't have one, carefully cut them with a knife as evenly as possible. Place an egg round on each rice cracker. Sprinkle with smoked paprika, kosher or sea salt, and a sprig of dill. I took these to a work potluck and it was so simple to mix up the dijon mayonnaise and cook the eggs the night before, then slice the eggs and assemble the bites right there in our work kitchen. People loved that it was just a taste of deviled egg, rather than half an egg. And you really get a lot of bang for your buck, making 18 servings out of 3 eggs!